A new laser technique allows researchers to precisely cut nano-sized units such as nerve axons. Collaborating with researchers at the University of Texas at Austin, UCSC molecular and cellular biologists Yishi Jin and Andrew Chisholm along with postdocs Hulusi Cinar and Hediye Nese Cinar were co-authors on a paper in the December 16, 2004 issue of Nature describing the technique. They used low-energy "femtosecond" laser pulses to partially sever the axons of anesthetized roundworms (C. elegans). 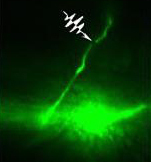 Using this technique, they were able to sever the axons without damaging surrounding tissue. They targeted the axons of nerves known to be responsible for backwards movement in the roundworm. After the nanosurgery, the worms could not move backwards. But within 24 hours, the axon connection between the neuron and the muscle was restored, allowing backwards motion again. "This new capability of cutting individual nerves offers the opportunity to use the well-characterized genetics of C. elegans to study the basic mechanisms of nerve regeneration," said Jin. "Until now there has been little study of nerve regeneration using genetic methodology, because most studies have been done on higher vertebrate organisms, where following the consequences of genetic manipulation is not yet readily accessible."